Catanga was imported in foal to Argo and had the colt Canter. Her daughters *Concordia and *Cassiopeja was exported to USA and Comedia is a broodmare and showhorse (both dressage and jumping) in Sweden. She belongs to the Gazella OA mare line, imp in 1845 to Jarczowce. This line is very sucessful, producing both showhorses and racehorses. It is also one of the larger lines with many individuals. It was almost lost during World War I with only three surving mares but one of them would do more than just continue the line, she would make it legendary. This was the mare Gazella II 1914 by Kohejlan OA. The two other mares were Fryga 1914 by Kohejlan 1903 and Gazella I 1907 by Selim. Fryga 1914 left a small branch that has produced some horses imp Sweden, among them the stallions Milagro and Dzahil and the mares Meluzyna and Melhafa-ed-Areg. The branch of Gazella I does not exist anymore, it was lost in World War II. Gazella II would have been considered a broodmare supreme had she only produced Elegantka and Makata, 3/4 sisters by Bakszysz and Fetysz respectively but beside them she produced yet another 5 broodmares and 3 stallions used for breeding. The Gazella family was continued in the female line by Elegantka 1923, Fryga II 1924, Jaskolka II 1928, Najada 1932 and Taraszcza 1937. Catanga belongs to the branch of Jaskolka II by Koheilan I. 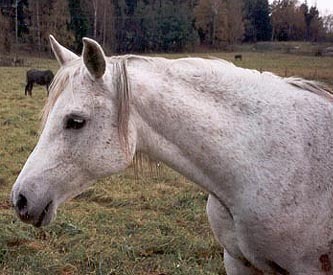 She was lost during World War II but before that she managed to produce the mares *Przepiorka, *Rybitwa and Wilga. Wilga is well-known in Sweden through her daughter by Laur, Worskla. Before Worskla left Poland she founded a family of superb racehorses through her son *Wosk and daughter *Wilma (dam of *Willa by Celebes imp Sweden). Carmen 1942 by Trypolis, the first daughter of Jaskolka II, is the dam of Comet 1953 and *Canberra 1954, full brother and sister by Abu Afas and of *Kassala 1952 by Bad Afas. *Canberra was the dam of *Candida by Aquinor. *Candida had four full sisters, all of whom were used in at the polish state studs: Camera, Camorra, Camerata and Capella.